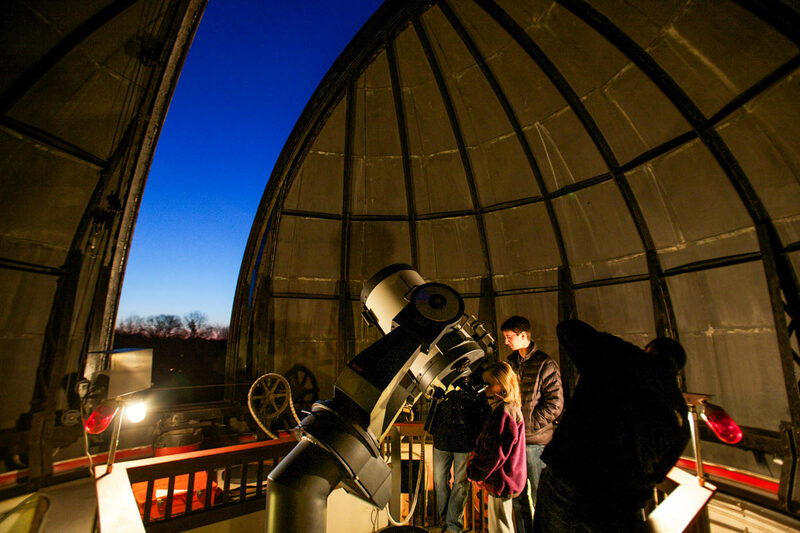 Students take a closer look at Jupiter and its moons through the observatory's 16" telescope. Photo: Thomas Carroll. The Strawbridge Observatory at Haverford College houses 12-inch and 16-inch Schmidt-Cassegrain telescopes which are actively used by students in Haverford astronomy classes. The telescopes are also periodically made available for public use with teaching assistants and/or professors present to provide assistance and background information about what is being viewed. Note The telescopes are only used when it is clear, and the domes are not opened when it is cloudy. If the weather is in doubt, your best option is to email strawbridge.observing@gmail.com and ask whether observing will take place. If you would like to bring a group to any of our events, please contact us early in the year to see if your group can be accommodated. Contact Reilly Milburn '19 and Katie Billings BMC '19 at strawbridge.observing@gmail.com for more information. Would you like to sign up for our email list? Please fill out this form. We would love to hear from you! These events include observing though one or more of our telescopes (weather permitting), activities for children, and a student-led talk on a topic in astronomy. 7–9 p.m. This event takes place rain or shine. 8–10 p.m. Rain date: Friday, April 5, 8–10 p.m.
7:30–10 p.m. Join us for the Philadelphia Star Party. This event takes place rain or shine. The Strawbridge Observatory is located on Walton Road, just off College Avenue between Haverford Road and Lancaster Ave.